New car launches don’t come much more significant than a fresh Ford Fiesta. That’s especially true in the UK, where the car has been a relentlessly rife runabout since its 1976 launch – the outgoing version flew to the top of the UK sales charts in 2009 and has stayed there every year since. Step in Fiesta eight. You’ll already have noticed the aesthetic parity between the seemingly evergreen Mk7 and this Mk8, but the similarities go deeper than that. In most senses, this feels like Fiesta 7.1. No bad thing. It’s slightly longer, wider and taller than before, so it’s more spacious, and if you’re into this sort of thing, Ford reckons it has ten per cent additional cornering grip this time around. Not bothered? Here are a few more pertinent percentages then: the doors take 20 per cent less effort to close; the windscreen wipers clear 13 per cent more of the windscreen; road noise is dampened seven per cent better; the gap between the roof and the tailgate is 30 per cent narrower; the glove box is 20 per cent bigger. This all speaks of a car that’s been tweaked rather than changed wholesale for the sake of it. Ergo, it has largely the same character on the road, which is to say it beautifully balances engaging handling with comfort – it just feels exceptionally well engineered. There are a couple of caveats though, the first being that ST-Line versions, on stiffer suspension and with specifically tuned steering, are noticeably more enjoyable to drive than the rest. 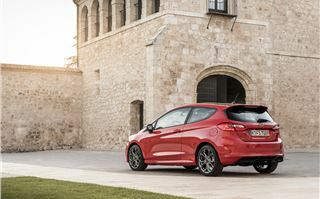 There’s a softer feel to non-sporty Fiestas, to the point of occasionally adopting a wallowing, almost bouncy character. That said, on the UK’s sporadically dreadful road surfaces, it certainly equates to a more comfortable car. 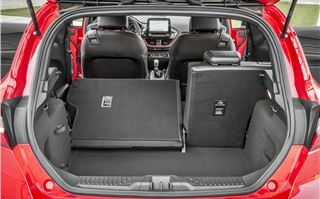 A good thing, paticularly as the upcoming new Volkswagen Polo will almost certainly ace on comfort and refinement. And generally, while the new Fiesta does feel more grown up and quantifiably better than its predecessor in many ways, it also feels like it’s lost a little of its sparkle. It’s not quite as much fun as it was, ST-Line or otherwise. The cabin, albeit inoffensive and very well made, has an arguably more generic feel this time around. 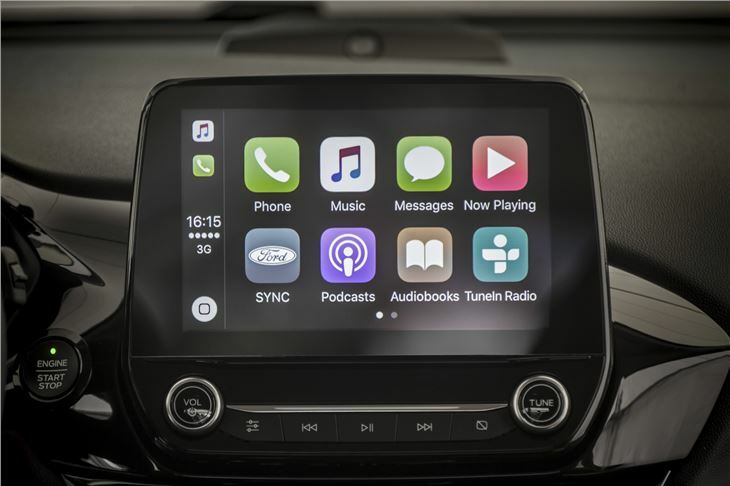 Dominated by a so-called ‘floating’ touchscreen (which doesn't literally float, disappointingly), the interior is moulded largely of the same shade of dark plastic throughout, the upper stuff softer to touch than the lower, as you'd expect. There are far fewer buttons than before though, which is good, and the screen is both arrestingly bright and intuitive. 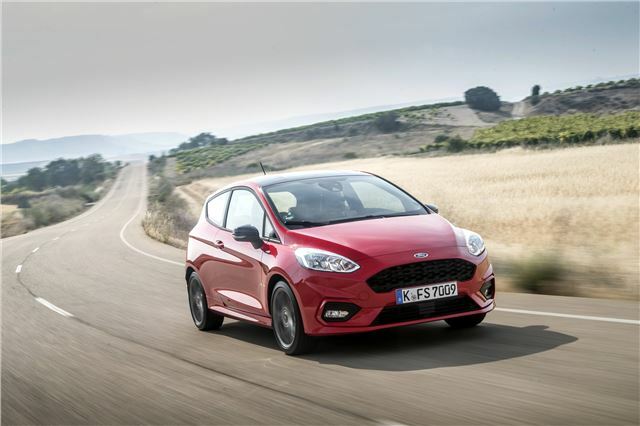 What the Fiesta does have is that ‘big car’ feel that all makers of small cars aspire to. 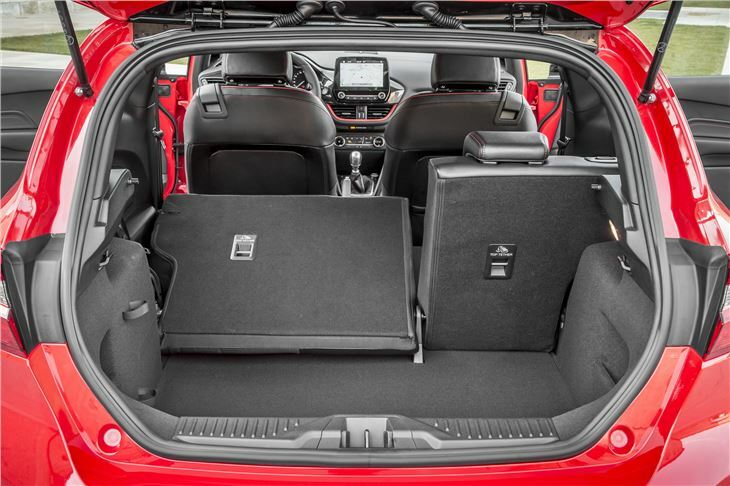 That’s owing not only to the basic stuff like an excellently tailored driving position – the armrest is, and we quote “positioned to benefit 19 per cent more of the Fiesta’s tallest and shortest drivers” – but to the reams of technology stuffed into the thing. That tech includes pedestrian detection with automatic braking, traffic sign recognition, lane keeping assistant, automatic parking - both in and out of spaces - and a part-digital instrument binnacle. No Euro NCAP rating yet, but it’ll be five stars all day. Conveniences include those pop-out door protectors that the Skoda Kodiaq has, too. 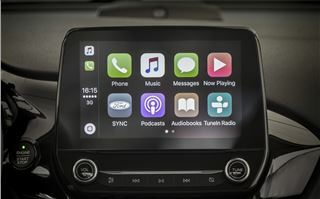 But Ford hasn’t forgotten that it’s the kids what buy Fiestas innit, and so the company has teamed up with B&O to give the car a banging (optional) stereo. 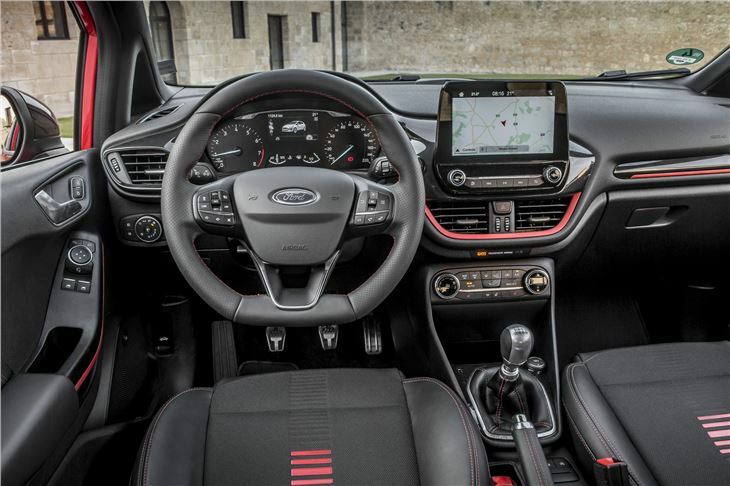 At the other end of the customer spectrum, Ford has introduced a posh Vignale verision this time round, that’s really expensive and has lots of leather in it. The range comprises (for now) Style, Zetec, ST-Line (pictured), Titanium and Vignale, with a few ‘X’ versions in the middle to confuse matters. Pricing starts at £12,715, though that’ll buy you little more than the shell, some plastic wheel trims and manual air conditioning, so start with Zetec, from £14,215, with alloy wheels and a touchscreen media system. As you’d expect, Ford has moved efficiency and performance forward with the engine range. A couple of 1.1-litre non-turbo three-cylinder petrol engines sit in the cheap seats, with 70- or 85PS and returning 64.2mpg with 101g/km CO2. More costly but much nicer are the 1.0-litre EcoBoost turbo three cylinders, with either 100-, 125- or 140PS. They’re smooth, punchy and sound moderately mellifluent. Economy is mid-60s there to, unless attached to a Powershift automatic, which costs 10mpg or so. 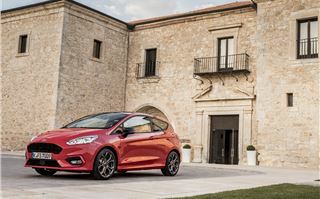 The sole diesel is a 1.5-litre unit offering a quite stunning 88mpg average, with either 85- or 120PS – the latter being the first “high powered” (Ford’s words) diesel offered in a Fiesta. It’s a lovely engine, smooth and relatively quiet, and really worth thinking about if you’re doing higher mileage. 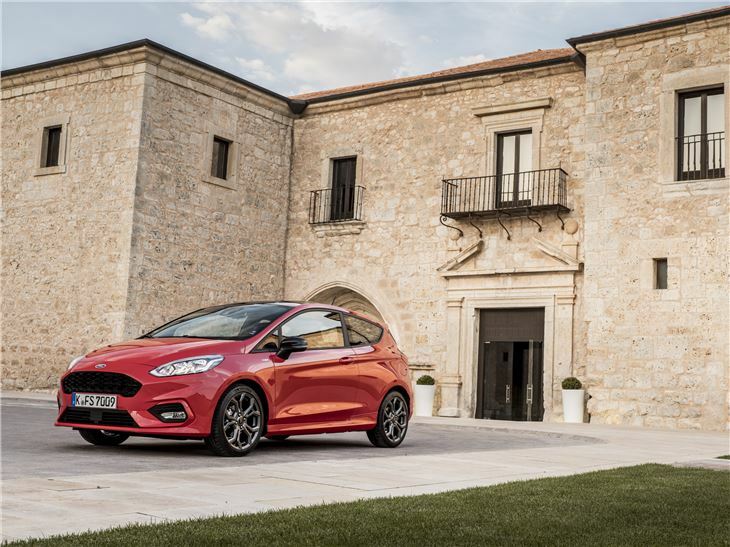 As per the last Fiesta, Titanium versions will be the big sellers, starting from £16,145 and the point at which the Fiesta begins to feel like a technologically advanced small hatch – big touchscreen, digital display in the instrument binnacle, keyless start, stuff like that. Buy one of those and you’ll really feel like your Fiesta is a big car masquerading as a small one. 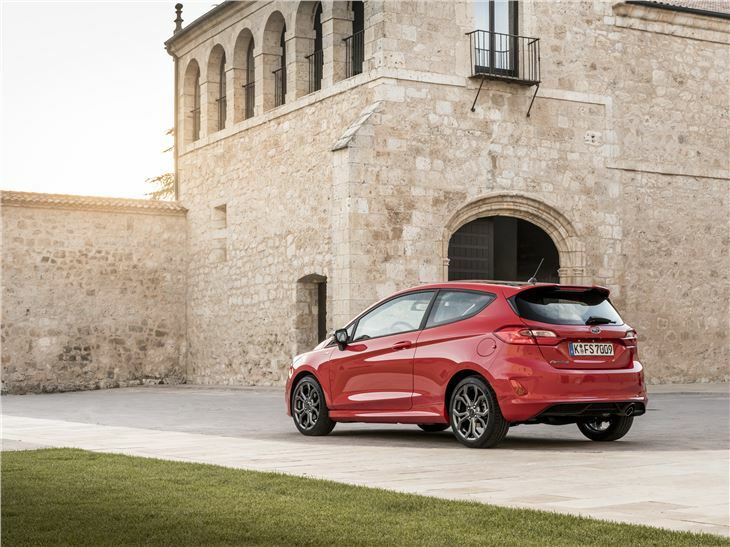 It’s not revolutionary by any means, but by improving in most ways – especially comfort, space and safety – the Fiesta will no doubt remain at the top of the sales tree for years to come. And justifiably so. You can order one now, first cars coming to the UK around August.